East meets West with this Middle Eastern twist on a campfire treat! 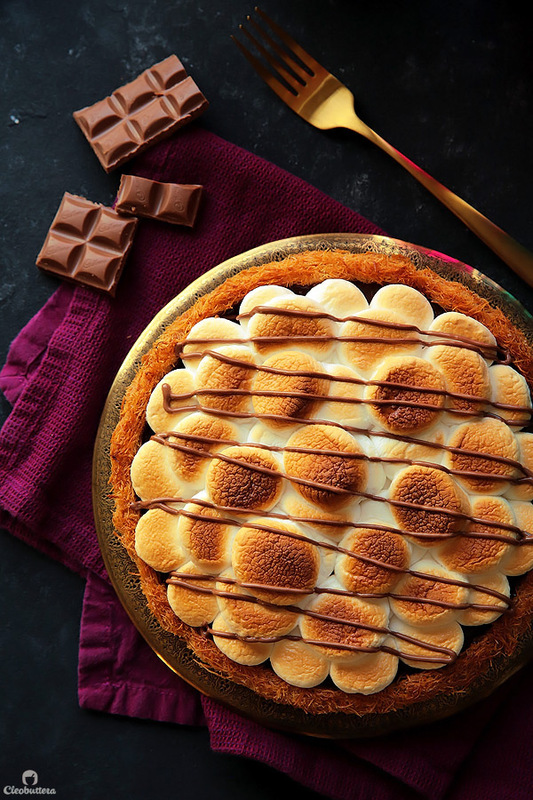 Everything you love about s’mores in an unexpected package. 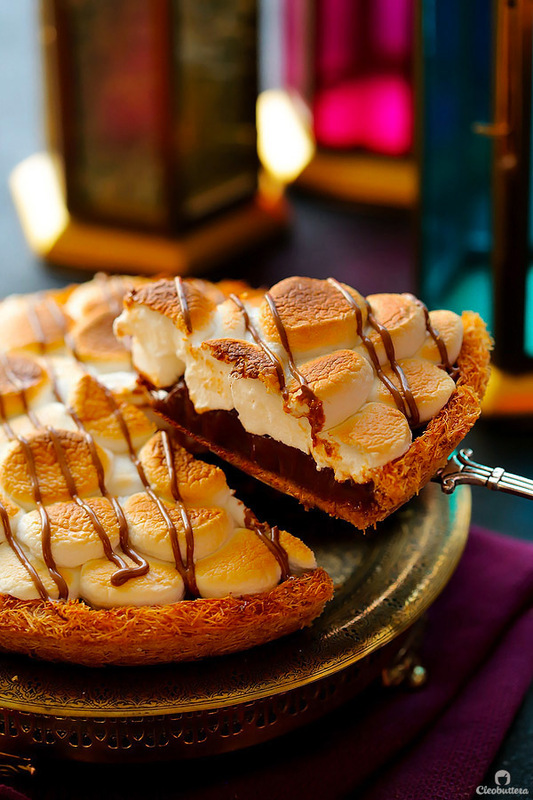 Crunchy caramelized kunafa crust, creamy milk chocolate filling and toasted marshmallow topping make for one uniquely delicious pie. Plus…recipe VIDEO included! If I ever write a cookbook (a girl can dream right? ), I know exactly what I want it to be about. 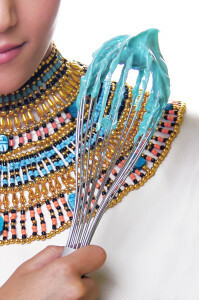 An edible representation of my Egyptian upbringing, my Canadian belonging, my American education and my unbiased love for international cuisine. A cleverly good food mash up of my culture and others that have had an impact on my life. Frankenstein desserts that do not actually turn out into monsters. Things that are as incredible in taste as they are in theory. It’s 50% kunafa, 50% s’mores, 100% delicious. Kunafa; the mega popular crunchy pastry of the Middle East and the Mediterranean; made from shredded, vermicelli-like phyllo dough and traditionally filled with cream, unsalted cheese or nuts. 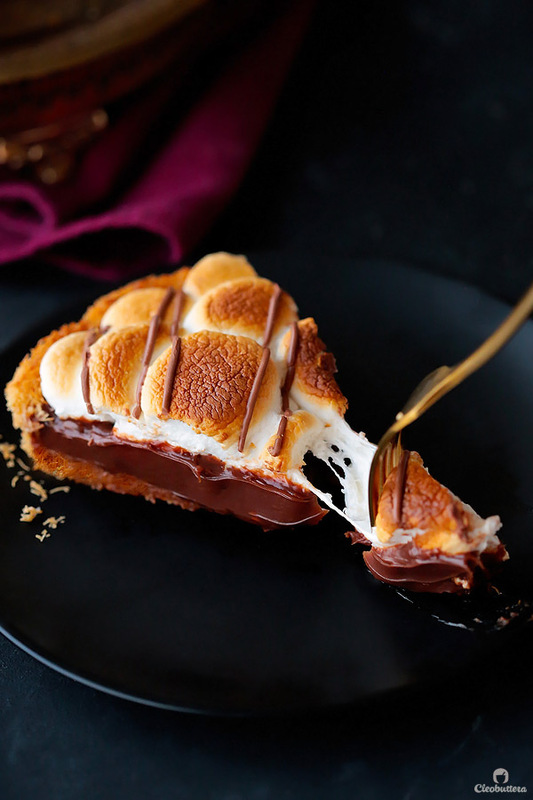 S’mores; the beloved campfire treat of North America, made by sandwiching a roasted marshmallow between two squares of graham crackers and a slab of milk chocolate. It’s messy, its ridiculous, it’s one of my favorite combos of all time, and it was begging to be stuffed in a kunafa. Kunafa purists…I know what you’re thinking…why mess up with a good thing? 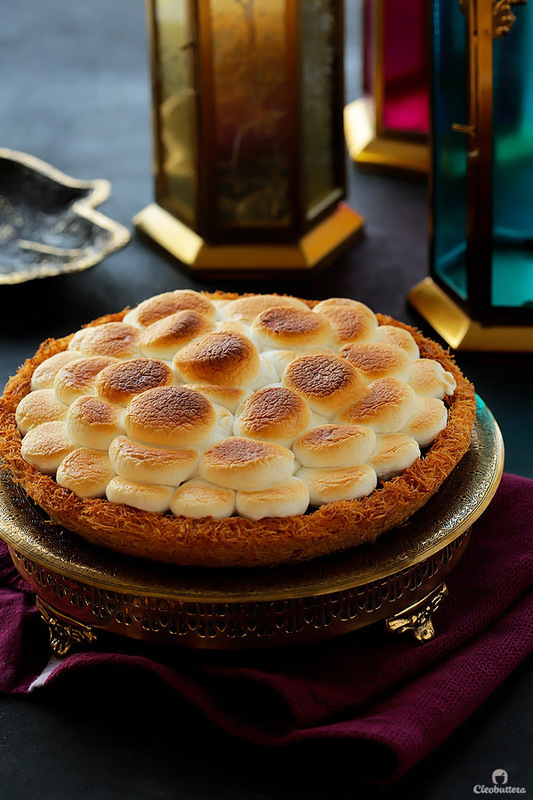 But then I say: caramelized kunafa crust with a graham cracker spirit, lusciously creamy milk chocolate filling, gooey toasted marshmallows. Then you say: I’ll give it a try. People…this is dessert mash up that does not kid around…it totally works, not weird at all and will fly your tastebuds to the moon. It’s one of those thing that might look like an overkill, but in reality is a delight to eat. It is with great honor to be collaborating with Cadbury Dairy Milk Egypt to bring this kunafa awesomeness into your life. You can thanks us later. 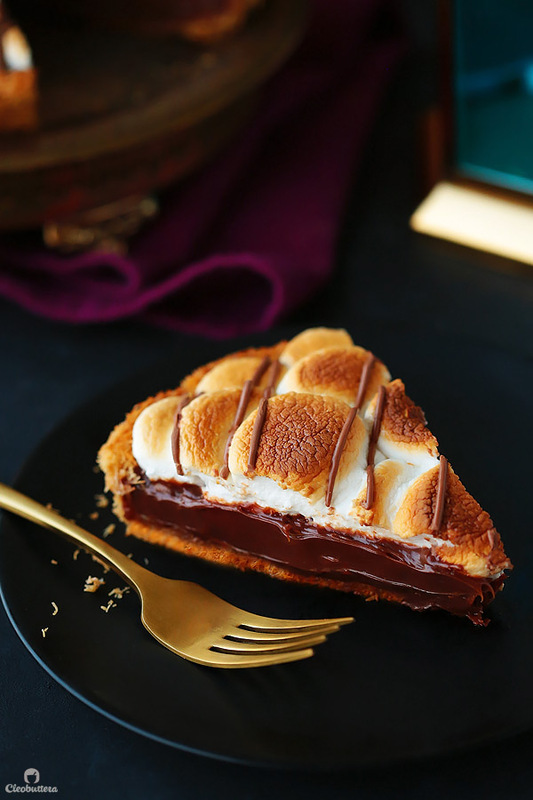 Between the crunch of the kunafa, and melty goodness of the marshmallows, chocolate plays the starring role here. 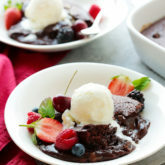 Whenever chocolate is stealing the spotlight, you can be sure that your dessert will only be as good as your chocolate. 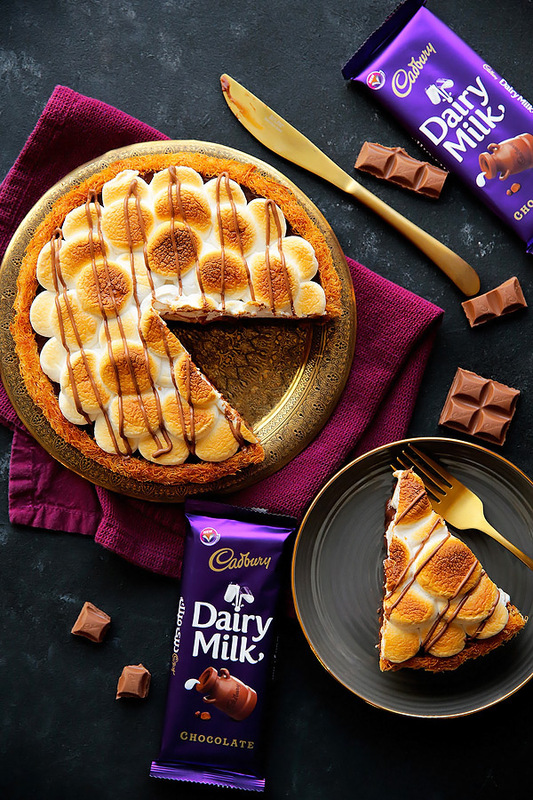 Thanks to Cadbury Dairy Milk’s chocolate, the center of my pie is every bit as amazing as I wanted it to be; melt-in-the-mouth, creamy, perfectly sweet and full of chocolate flavor. So gather up your ingredients folks…because we’re about to make some magic! It’s actually pretty easy to come together; take a look! For the crust, I wanted to capture the essence of graham crackers without actually using any. So to give the kunafa the buttery, cracker-y flavor I was after, I opted for clarified butter instead of the more typical ghee. Why? Because the ghee’s flavor was too overpowering here and didn’t marry well with the rest of the components. Why clarified? Because straight up butter contains milk solids that prevents the kunafa from crisping up to its fullest potential. So by clarifying it, we’re getting rid of the milk solids, so our kunafa can turn out as crunchy as can be. I also added sugar to the kunafa…which is unorthodox. 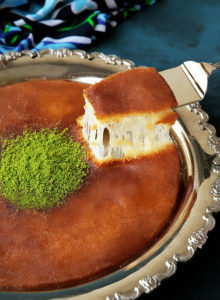 Usually kunafa is baked without any sweeteners, then sweetened with sugar syrup upon it coming out of the oven. 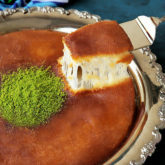 I found that sugar is necessary here for structure; without it, the kunafa strands didn’t hold well to itself , the sides collapsed during baking, and the crust crumbled as I sliced into it. 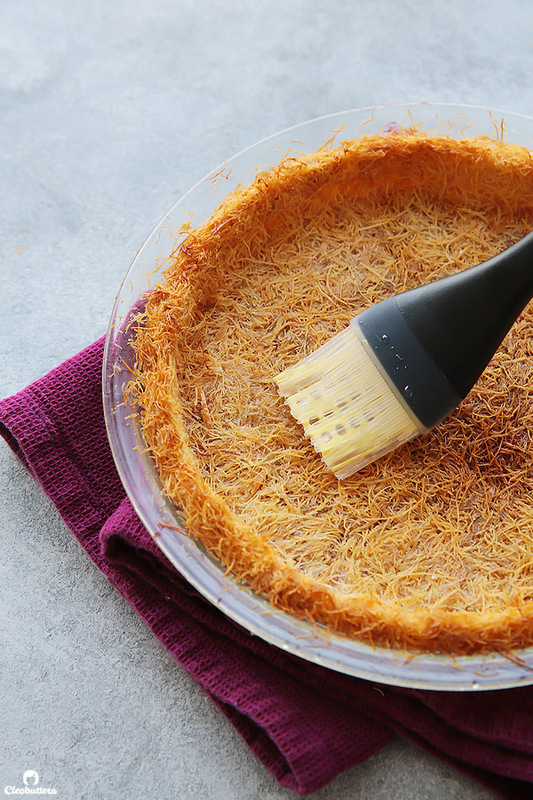 By adding sugar at this stage, we allow the sugar to melt into the kunafa strands as the crust bakes, acting like a glue and fuzing the strands together! As a bonus…the sugar actually caramelizes as it melts, giving the Kunafa a heightened caramelized flavor that is just irresistible. 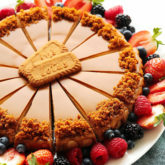 I also found that by adding a tiny bit of cinnamon to the crust, gives it an unmistakable cracker feel, without actually tasting like cinnamon. It’s that secret ingredient that I urge you not to skip. That somethin’ somethin’ that you can’t put your finger on, but takes the pie to another level of deliciousness. When everything’s mixed and done, you’re gonna press it into a pie dish. The flat bottom of a measuring cup really helps with packing it well into a compact layer. Then into the oven it goes! 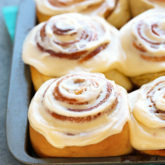 As soon as it comes from out of the oven, you’ll wanna brush it with a tiny bit of sugar syrup. 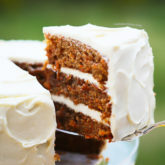 Remember…it already has sugar in it, so we don’t want to soak it this time around. Then set aside to cool, till we prepare the chocolate filling. 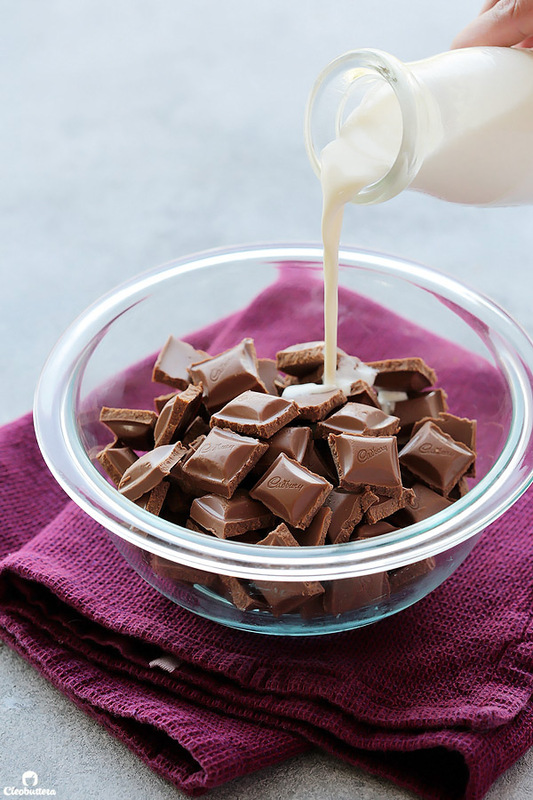 Oodles of Cadbury Dairy Milk chocolate squares get combined with heavy whipping cream and then microwaved. After stirring for a few seconds, it should turn into this glossy, shiny glory. A couple tablespoons of butter is then added to give the filling a sturdier and sliceable structure. and poured over that yummy crust, then shipped to the fridge to set. 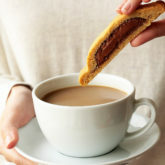 When its time to serve, dot the surface with marshmallow halves…as much or as little as you’d like. Clearly I’m Team Much. Then broil till the surface is nice and toasty and the inside is molten and gooey. 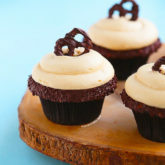 A few extra drizzles of chocolate over the top…never hurts. And voila my friends! An American favorite with a Middle Eastern twist…guaranteed to tickle tastebuds East and West. I totally meant for that to rhythm. Don’t mind me…just make the pie. 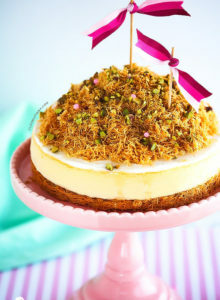 East meets West with this Middle Eastern twist on a campfire treat! 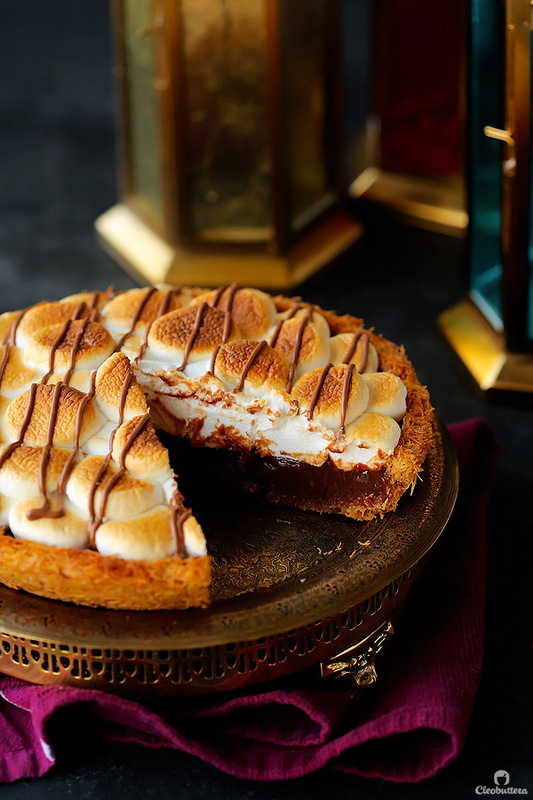 Everything you love about s'mores in an unexpected package. 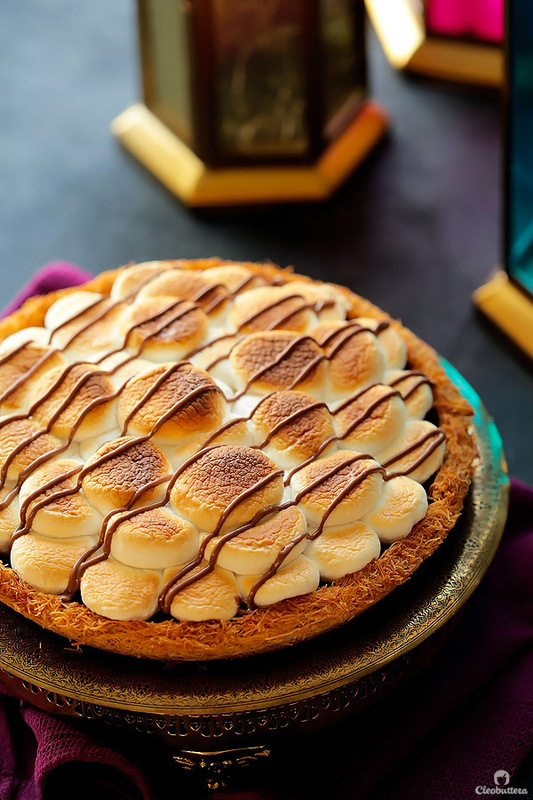 Crunchy caramelized kunafa crust, creamy milk chocolate filling and toasted marshmallow topping make for one uniquely delicious pie. In a small saucepan, combine together the sugar, water and drops of lemon juice. Set over high heat. Try to avoid stirring it as it heats to prevent crystallization from happening. Once it comes to a boil, reduce heat to low and allow to simmer for 5 minutes or until the syrup thickens slightly. Set aside to cool completely before using. Adjust oven rack to middle position and preheat oven to 200C/390F. Grease a 9-inch pie dish with butter, then line the bottom with a circle of parchment paper and grease with butter as well. Start by clarifying the butter. 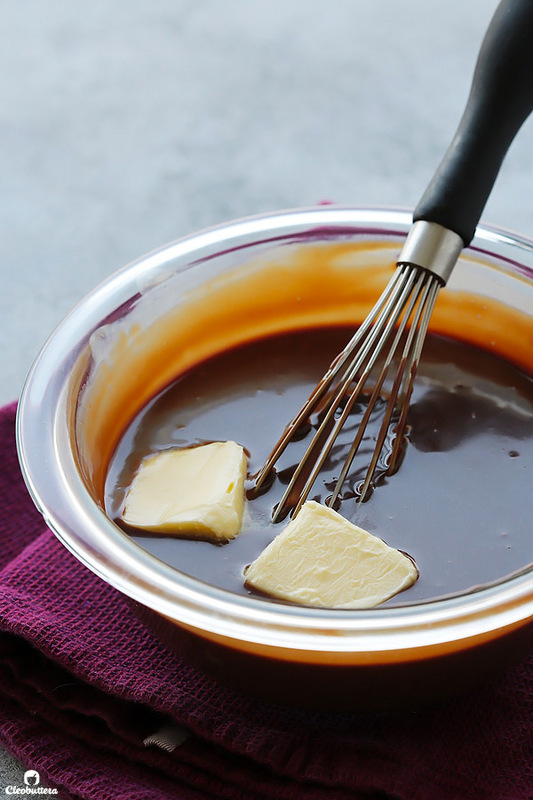 In a small saucepan, melt butter slowly over medium-low heat until the milk solids have separated from the butterfat, and collected on the bottom of the saucepan. Remove the pan from heat, let the butter settle for 10 minutes, then carefully skim the foam from the surface with a spoon. Slowly pour the clear yellow butterfat into a bowl, leaving all the milk solids behind in the saucepan. Measure out 75g (1/3 cup) of the butterfat and use in the kunafa crust mixture. 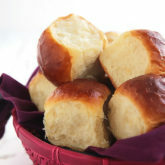 Discard or set aside remaining butterfat, if there's any, for another use. 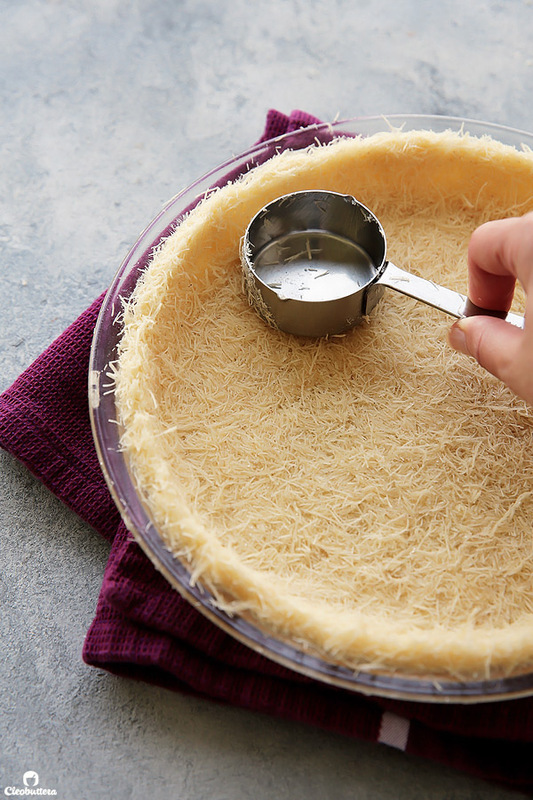 Over a medium bowl, shred the konafa/kataifi dough into small pieces. I've found that cutting the kunafa while semi frozen, makes for the easiest way to break it. So even if using fresh kunafa, stick it in the freezer for about an hour before cutting it. 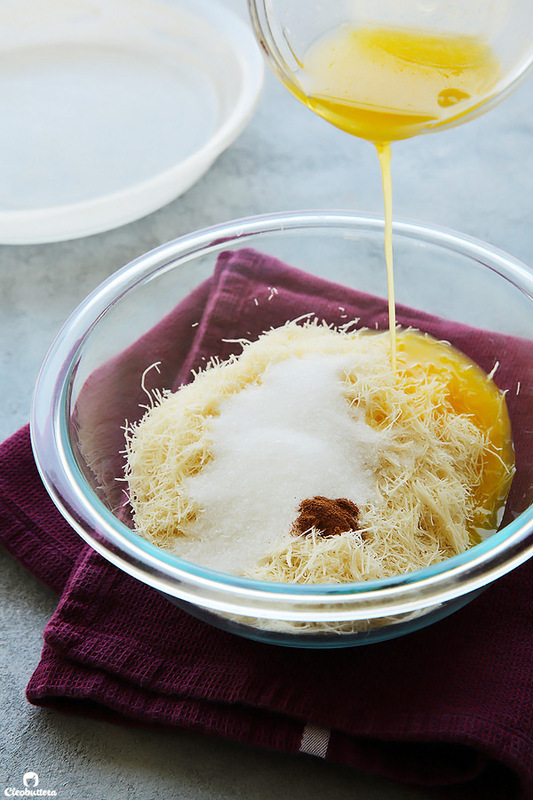 Pour in the clarified butter, sugar and ground cinnamon and using your hands, mix everything well together, rubbing the clarified butter into the kunafa until evenly coated. Transfer the kunafa mixture to the prepared pie dish and spread to evenly cover the bottom and sides. 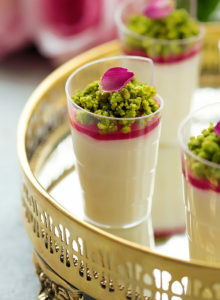 Using the flat bottom of measuring cup or ramekin, firmly press to pack the mixture into a compact layer. Bake the kunafa crust until deep golden brown in color; 20 to 25 minutes. 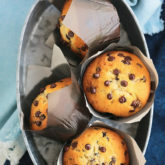 Check after 10 minutes, if the sides are browning too fast and the bottom is still pale in color, then lightly cover the sides with foil to prevent from over browning. 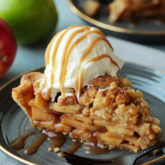 Take the crust out of the oven and immediately brush with the cooled sugar syrup. 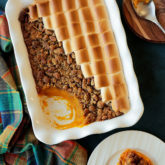 Allow the crust to cool completely at room temperature, or in the fridge or freezer if you're in a hurry. Meanwhile make the chocolate filling. 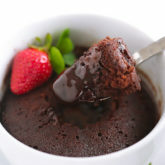 In a microwave-safe medium bowl, cut the chocolate into chunks and pour in the heavy whipping cream and add in the salt. Microwave until the cream starts to boil; about 1 1/2 minutes. 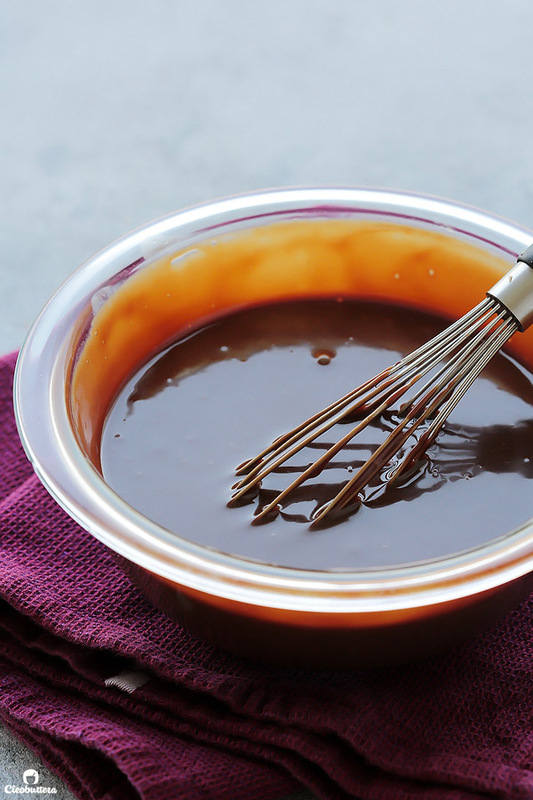 Take the mixture out of the microwave and whisk until the chocolate is completely melted and the mixture has become very smooth and homogenous. Add in the butter, and whisk until melted and well combined. 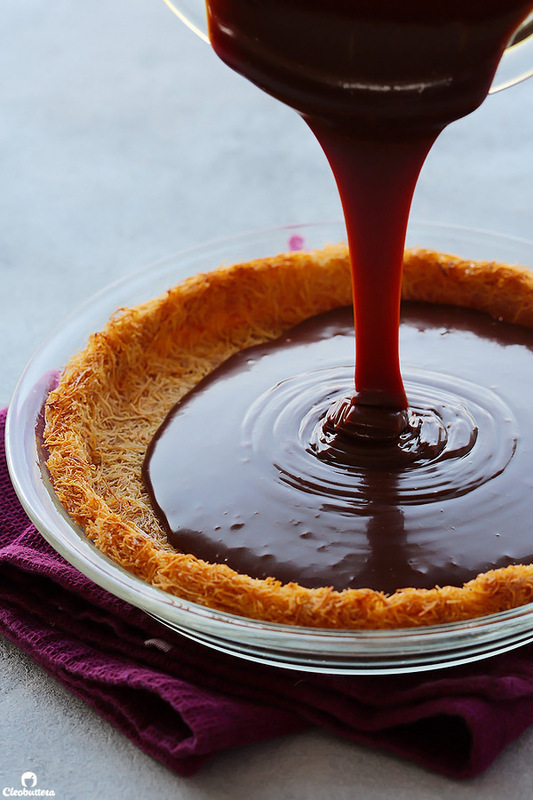 Pour the chocolate mixture over the cooled kunafa crust and spread into an even layer. Lightly cover with foil, making sure its not touching the chocolate mixture and refrigerate until set; 1 to 2 hours. About 1 hour before its ready to serve, take it out of the fridge to take the chill out of it, as its best served at room temperature. When ready to serve, turn on the oven's broiler to high. 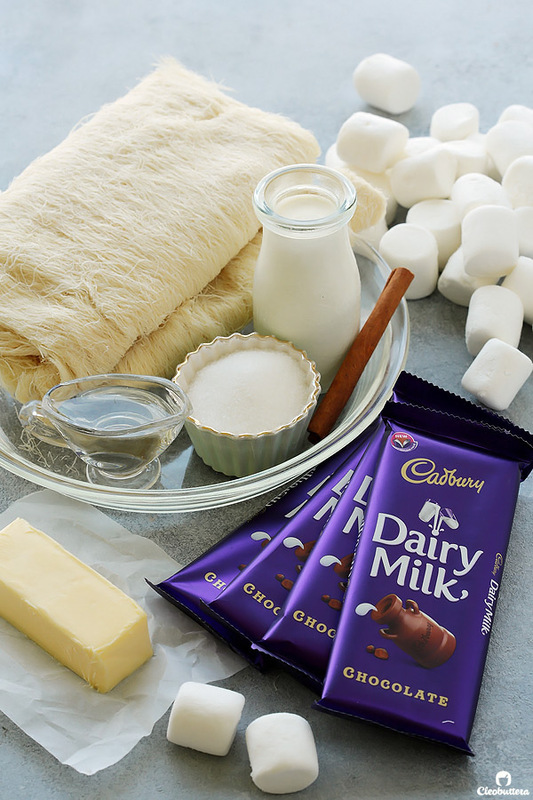 Arrange the halved marshmallows over the chocolate layer, sticky side down. 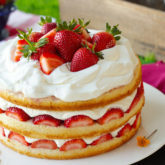 You can make only one tier of marshmallows or up to 3 tiers (as shown in the pictures) according to your preference. 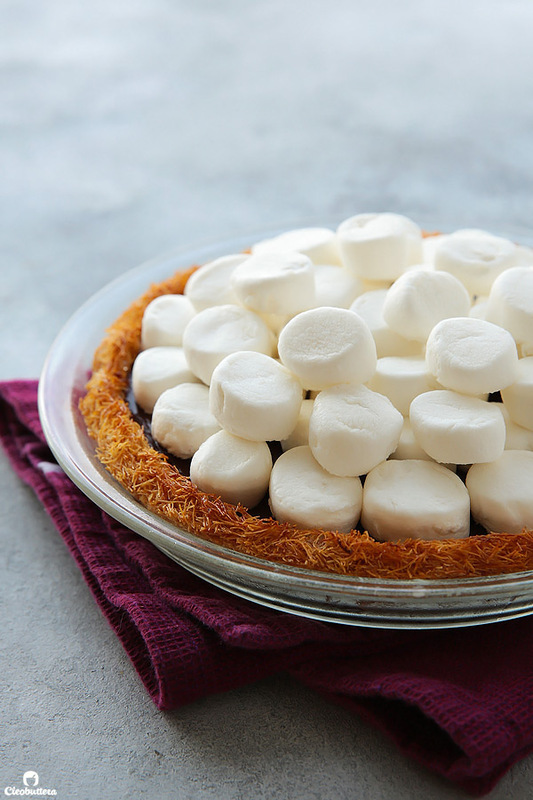 Place the dish under the oven's broiler, and broil until the marshmallows have toasted and turned dark golden brown in color; about 5 minutes. Keep a close eye on it and stay near, as they can turn from blonde to charcoal in seconds. 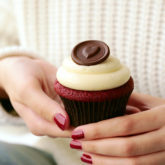 If desired, use a piping bag or plastic bag with the tip snipped off to drizzle melted chocolate over the marshmallows. Serve right away, or within several hours. Leftovers keep well for 1 day, in an airtight container. Sugar syrup can be substituted with 3 tablespoons Big Batch Sugar Syrup. And last night for the umpteenth time I made your cheese konafa. I am planning on going to the halal store praying they have the special cheeses to make the last Syrian style konafa you posted. Though I am going to try my luck with a regular frying pan. I don’t have the one you suggested. Hahahaaaaaaa what can I say? I can’t get enough of kunafa…love the stuff and it practically goes with anything and everything. Thank you Nale! I hope you love it as much as we do! Thank you Stacey! 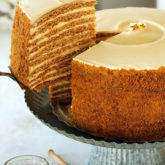 So happy to hear that you love the Caramel Cake. It’s definitely one of my favorites too. I hope you love this one just as much. Thanks you so much Mohamed! I’m so flattered to hear that.